As a store owner, what really drives me nuts more than anything else, are comments like, "That's ok, I'll just buy it on Amazon," or "Amazon is out, so I'm here." These comments make me a little sick to my stomach and they're the worst thing ever. Oh wait, that's not it. As a store owner, what really drives me nuts more than anything else, is not knowing. When I accidentally order an expansion for a game I've never carried and it becomes a best seller. When a $25 map pack for a $50 D&D book outsells the book. When I can't figure out if Amazon is eating a quarter or a half or three quarters of a market segment, or whether it's actually Amazon racing to the bottom, or my friends who own game stores. When a long time customer simply disappears. When a group simply stops playing a game. When nobody comes. Yeah, that's what drives me nuts more than anything. Maybe what really drives me nuts is the apathy that develops over time because caring is so painful. Seeking the unknowable is an act of faith, and you can throw yourself off that cliff of faith or you can live in an agnostic world of gray. Deciding not to care is psychologically protecting yourself from heartbreak. It's building a retaining wall against the slow erosion of peace of mind. It's going through the rituals of retail never sure if They will come. No, it's definitely the first one. "We were drawn to Dragons and Things because it embodies the core of what tabletop gaming is all about: good friends, wild stories, and high-fantasy adventure. We look forward to working with them as they bring Pathfinder and Starfinder to life through vibrant characters and officially licensed RPG hijinks," said Jim Butler, Vice President of Marketing & Licensing at Paizo. "Jim Rodehaver and I have always loved creating epic fantasy stories both at the tabletop and on the screen. What started years ago with his dad as GM has now grown into a tabletop experience that includes friends and loved ones, and extends to fans across the world every Friday night on Twitch. We're beyond excited to be partnering with Paizo on the next part of our adventure and very fortunate that they share our love of fun, memorable, and sometimes loud storytelling involving dragons and things. The team is looking forward to making 2019 just the beginning," said founder and CEO of Two Kings Entertainment, Adam Rady. Dragons and Things isn't just about rolling dice while the internet watches. The cast chats with the audience live every week. Fans influence the game itself in a dynamic story that leaves even the GM guessing what might happen next. It's a community experience that keeps old fans coming back and welcomes new fans with open arms. twitch.tv/datdragonshow with its flagship show, Dragons and Things. It is also responsible for Bedlam and Discord, and is set to release a brand new podcast to Patreon supporters this year. Get access to this exclusive content and more on patreon.com/datdragonshow and stay up to date on all the latest from the Krag Krew @datdragonshow on Twitter and Instagram. Paizo Inc. is one of the world's leading hobby game publishers. Since 2002, millions of players have joined the goblin army by playing the Pathfinder® and Starfinder® roleplaying games across tabletops, at conventions, at their favorite local game stores, and digitally on virtual tabletops. Paizo.com is an online retail hobby destination for millions of gamers that carries the latest products from top hobby game publishers. Players can also find accessories, like dice and maps, miniatures, T-shirts, goblin plush toys, and the newest releases to quickly replenish their adventuring supplies for the next dungeon run. Did you like this press release? 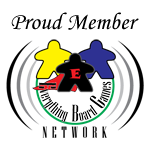 Show your support: Support me on Patreon!Also, click the heart at Board Game Links , like GJJ Games on Facebook , or follow on Twitter . And be sure to check out my games on Tabletop Generation. 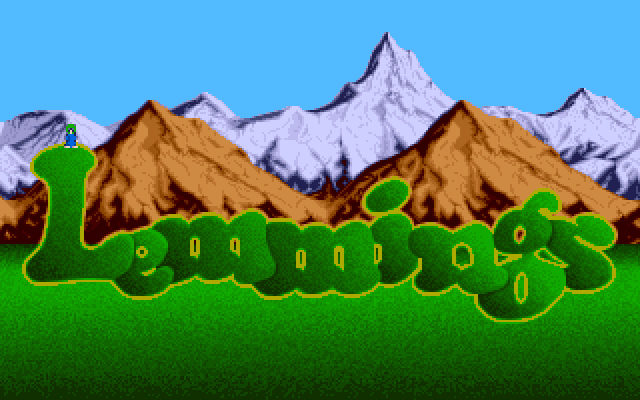 Along with Tetris, Lemmings has to be one of the most ported games out there. Originally released in 1991 for the Commodore Amiga, it has been ported to 30+ devices ranging from the Nintendo Gameboy to the Playstation 3 and Mobile Phones. For me, the game is best controlled with a mouse which leaves us with the initial versions from 1991 for the Amiga, Atari ST and DOS. Although all three versions play the same, the original Amiga game has the best graphics and sound in my opinion. 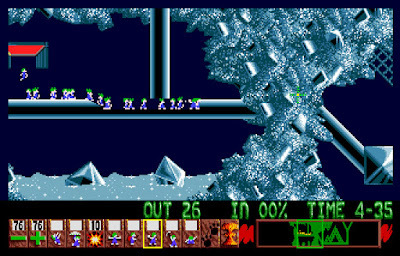 The concept of the game is simple - guide a specified percentage of Lemmings through the exit portal within the time limit. 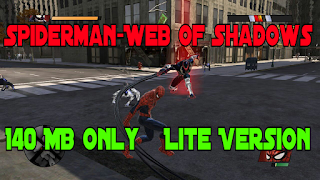 There are 120 levels split across four difficulty settings. FUN is the easiest and is mainly there to get you used to the controls. The game gets progressively more difficult through TRICKY and TAXING, with MAYHEM being the most demanding. There is a password system so you don't need to repeat completed levels. One of the TAXING levels. Note the lack of available skills. Each level starts with the Lemmings dropping out of a trap door. Their release rate is shown at the bottom left of the screen. 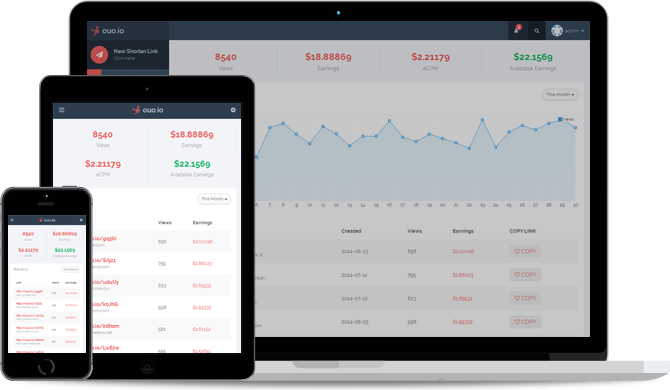 This can be increased or decreased using the + and - icons, but cannot be set lower than the initial rate. Left to their own devices the Lemmings will move in a certain direction until they reach an obstacle, at which point they will turn around and walk the other way. If they encounter a long drop, water, lava, a trap or anything else lethal to them, they will walk mindlessly to their deaths like, er, lemmings. You do not control the Lemmings directly but give them actions by using the skill icons. The Climber icon allows the Lemming to scale a vertical surface. Using Floater on a Lemming allows it to survive a high fall. The Bomb causes the selected Lemming to self destruct taking a chunk of the landscape with it. Blocker stops other Lemmings passing and sends them in the opposite direction. A Bridge Builder constructs a set of twelve steps to cross chasms or climb to higher platforms. The Basher icon orders the chosen Lemming to dig horizontally if in front of a suitable surface. Use the Miner or Digger skills and the Lemming will respectively tunnel diagonally or vertically down. Building a stairway to heaven. The final two icons are 'Paws' and Nuke 'Em. Paws obviously pauses the game. You can still scroll around the level to plan a route or quickly get to a Lemming that's about to die, and becomes invaluable in later levels with the tight time limit. Nuke 'Em causes all your Lemmings to explode if a level is obviously lost. Some parts of a level can be made of metal and can't be dug through, blown up or damaged in any way. Some walls can only be tunneled through from a certain direction. This obstacle can only be tunnelled through in the direction of the arrows. The metal floor prevents digging under. 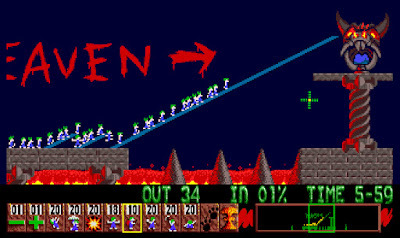 When Lemmings was released in 1991 it was a totally original concept - there was nothing else like it. In 2016 it is still fun to play. 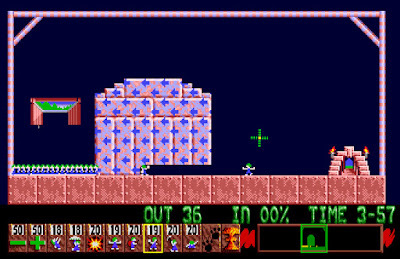 The graphics are still acceptable and the tiny Lemmings are well animated despite being only 8 pixels high. The soundtrack is good for the most part, mixing some original songs with music from other Psygnosis games and some well known tunes (March of the Mods on the intro, the Can Can and the like in game). Sound effects are limited in number but are effective. The learning curve is pretty good too, ranging from very simple on the lower levels to practically impossible in the MAYHEM stages. Like Tetris it's a game the that stands the test of time. For those who do not know this great classic game, GTA San Andreas is an open world action adventure game developed by the great Rockstar Games. San Andreas was released for PlayStation 2 consoles in October 2004, although later versions of the same would be published for both sixth, seventh and eighth generation consoles, also on computers and now on mobile devices. 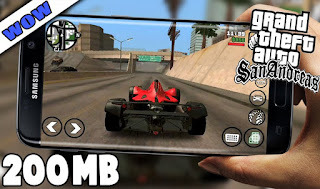 Grand Theft Auto: San Andreas, who does not know this great classic game, is an open world action adventure game developed by the great Rockstar Games for those people. San Andreas was released for the PlayStation 2 console in October 2004, although later versions will be published for the sixth, seventh and eighth generation computers and still on mobile devices. GTA: San Andreas is an activity enterprise computer game created by Rockstar North and distributed by Rockstar Games. It was discharged for the PlayStation 2 on October 26, 2004, and on June 7, 2005 for Microsoft Windows and Xbox. A top notch remastered presentation on 30 June 2015 and 1 December 2015, personally found a physical discovery for both Xbox 360 and PlayStation 3. It is the seventh title in the Grand Theft Auto System, and is the main primary part of the 2002 Grand Theft Auto: Vice City. For Game Boy Advance, Grand Theft Auto Advance was discharged on a unpublished day with a turn. Amazing Theft Auto: San Andreas is played in the position of an open world from a third person's perspective, allowing the player to cooperate with the Diverson world for entertainment. Entertainment is set in the ridiculous American area of ​​Sin Andreas, which is intensely in light of California and Nevada. [B] Three metropolitan urban communities in the light of Los Angeles in San Andreas Province: Los Santos; San Francisco in the scene of San Firos; And in the light of Las Ventures, Las Vegas, the single-player story is taken after Carl "CJ" Johnson, who returns to Los Santos's home from Liberty City after the murder of his mother. Karl discovered his old loved ones in confusion, and during the turn, he tried to restore his old group, struggles with the police, and gradually opens the reality behind his mother's murder. This plot relies on various real opportunities in Los Angeles, including the competition between blood, cripps, and the Hispanic road group, the crisis of partition of 1980, the LAPD Rampal Smirmini, and the 1992 Los Angeles riots.